In the spring of 2010, I dug up a few milkweed plants along a bike path I often ran along and transplanted them to my garden. As I wrote then in a blog titled “Field of Dreams of Monarchs,” I had a very optimistic “if you plant them, they will come” vision. And, sure enough, they came that very first year. Since then those few plants I transplanted have scattered their cottony-parachute seeds and resprouted from roots until I now understand why one part of their name is “weed.” Common milkweed, Asclepias syriaca, is a beautifully-adapted colonizer. I now regularly pull it up out of my lawn, and see it spreading over to my neighbors on both sides as well. My yard should have become not just a field of dreams but a heaven for monarchs. But somehow, it didn’t. 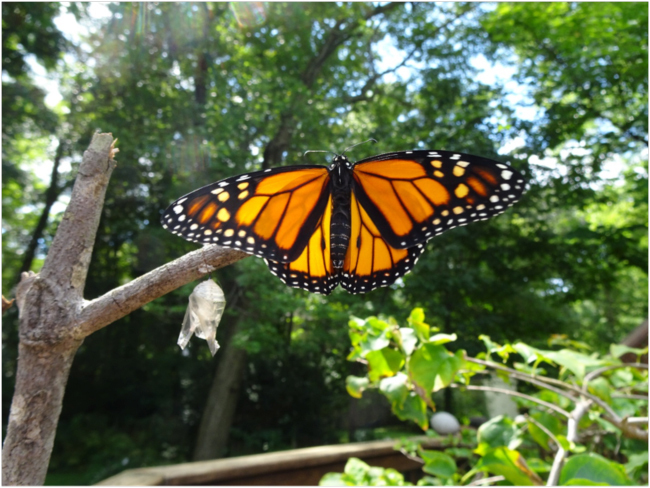 In a few of the ensuing years – two or three maybe – I saw monarchs laying eggs on my milkweed, and occasionally found a few tiny larvae chewing holes in milkweed leaves, but they never seemed to survive. I never saw the big, hungry fifth-instar larvae of that first year. Until this year. In August I started to see monarchs in my yard regularly. Some were females, fluttering low among the milkweed lining my driveway, landing and tasting the leaves, and sometimes arcing their abdomens under to lay their tiny eggs. Some were males, flying high among the tops of the tall Joe Pye Weed and scouting from perches there, waiting for mate-able females who might wander by. After an eight-year gap, monarchs were coming back to my field of dreams. The first year that monarchs came to my fledgling milkweed patch, they took it by storm and surprised me, and I pretty much let them do their own thing. 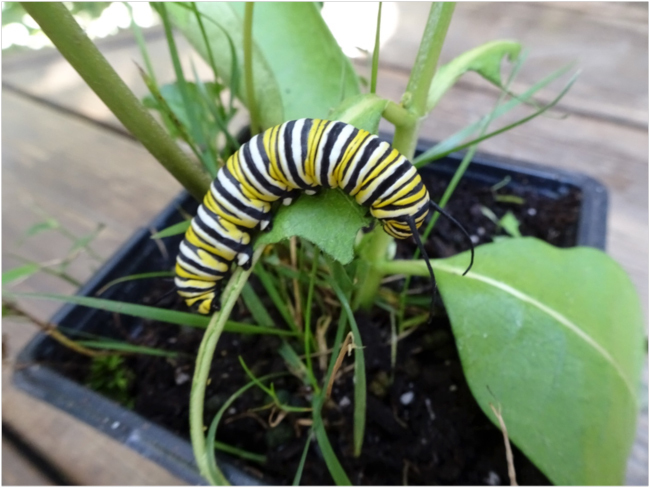 When I started to see eggs and larvae this year, I decided to try to help them out, to create a monarch-safe environment where I could also observe them. So, I started to take them into an old aquarium covered with a screen taken from one of my windows. I fed them as needed with milkweed cuttings from my yard, and could observe their progress from egg to adult. The results were spectacular, beyond my expectations. 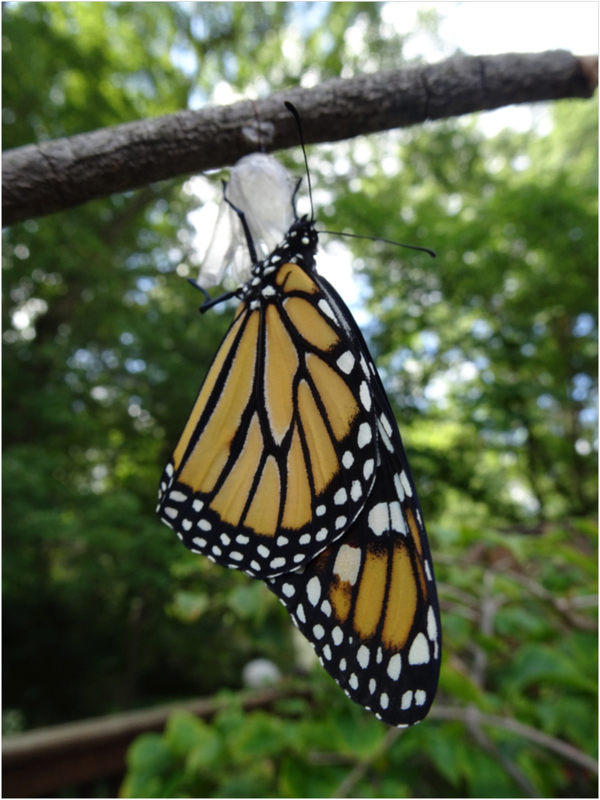 I watched 14 monarchs grow from eggs or first-instar larvae, pupate into delicate, jeweled, jade-green chrysalides, eclose as adults, and fly toward Mexico. 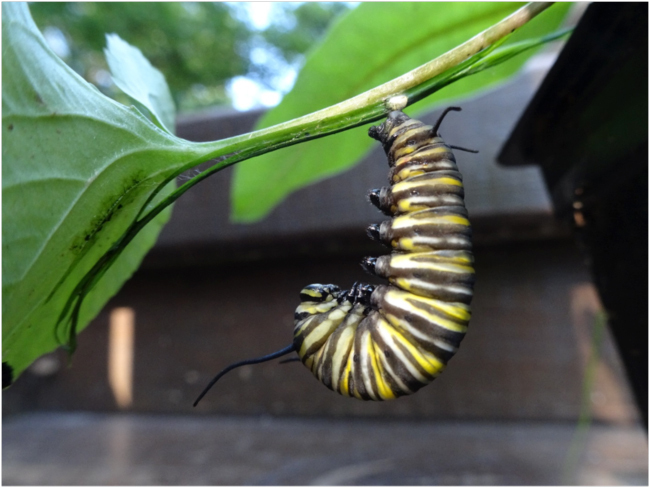 The tiny larvae that hatched from sprigs of young milkweed I brought into my aquarium grew in two weeks or so into leaf-gobbling giants, fifth-instar larvae an inch and a half long, with yellow, black, and white bands ringing their fat bodies. Like skunks, they were already showing the warning coloration that communicates to birds “don’t eat me, I’m poisonous”! Chock-full of toxic cardiac glycosides from eating milkweed, they want to let the birds know they are bad eatin’ before they get eaten. These comparatively-prosaic warning patterns get transformed into the spectacular colors of adult monarchs, the epitome of evolutionary artfulness. Toward the end of their fifth-instar existence, these larvae seemed to get lethargic. Bored, maybe, of eating toxic milkweed. Then they got restless, and started crawling for high places, looking for somewhere to take a nap. Usually in the late afternoon of that restless day they settled down, often on the window screen covering the aquarium, but sometimes on the rib of a big stiff milkweed leaf, and spun a webby pad of silk from their abdomen. They eventually relaxed and released the grip of their caterpillar legs, and dropped into a “J” position, their heads curled up toward their bodies, with their long antennae drooping. In a lucky moment, I happened to be watching one of these hanging-J larvae, which seemed to be getting especially grey. 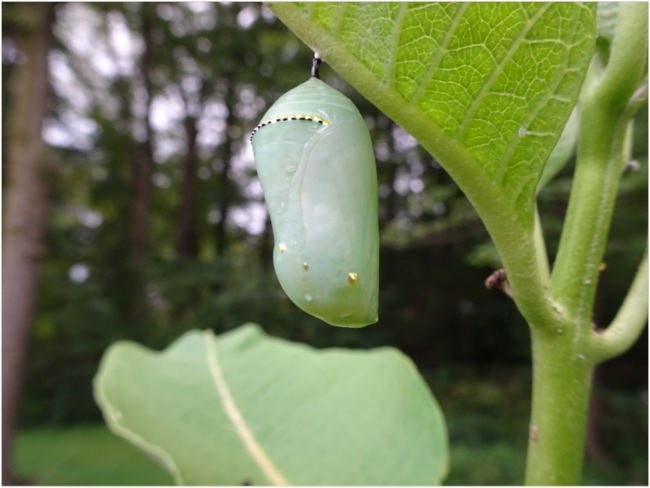 I watched as the fifth-instar “skin” split at the back of the head, and a shiny-green chrysalis poked out. 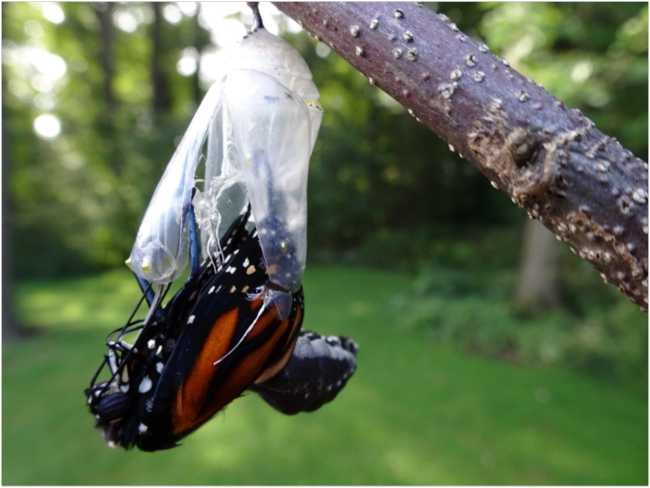 The transforming larva pulsed and throbbed, splitting the old larval skin more and more, until it was a dark ring at the top of the new chrysalis. The motion changed to wiggling and twisting, and in a few seconds the dark larval skin dropped to the ground. The orgasmic transition was over in less than a minute, and the shiny jade-green and gold-jeweled chrysalis hung still, falling into its deep metamorphic dream. If the larvae had hung themselves from the window screen covering the aquarium, I needed to get some control of the situation and assist them further on their journey, so I transferred them to other more-manageable perches, following the instructions for moving monarch larvae I found online on the Monarch Watch website. Basically, with a piece of thread you have to lasso and tie off the cremaster – that silken web and black stalk from which the larvae hang as they pupate – and then tie the thread with the chrysalis to a stick or branch. At first, I felt like I was performing open-heart surgery; my hands were shaking and I was sweating. But I gradually gained skill and confidence, eventually tying 14 chrysalides onto small branches pushed into canning jars filled with sand. 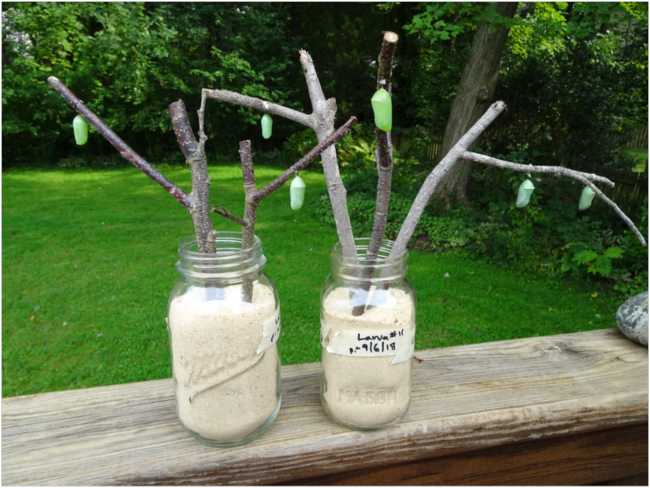 The temperatures were warm here at the turn of August to September, and after only about 10 days after pupation, each green chrysalis became transparent toward the end of the afternoon. 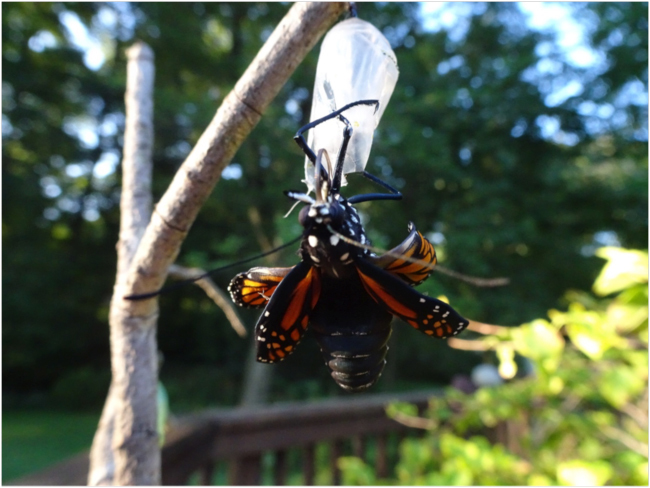 By morning, it looked mostly black, but the orange color of adult monarch wings showed through the diaphanous shell of the chrysalis. I was able to watch as many of the chrysalides popped open and the adults emerged. It sometimes took some patience, sitting by them for an hour or two reading the paper and sipping coffee, never letting my gaze drift away for more than half a minute. I never found any clear visual indication that eclosion was imminent; it was always a quick surprise. Wait, watch, be alert, be there in the present moment. Not a bad practice, really. Once the transparent shell began to split, the new butterfly-being dropped out in less than 30 seconds, and changes happened fast – almost too fast to see and comprehend. Because I was taking photos, I have a record of “truth,” I think… but when I look at the pictures, I am amazed at the fat abdomen of the new butterfly or the curled, furled new wings that were visible only for seconds. Did I really see that? 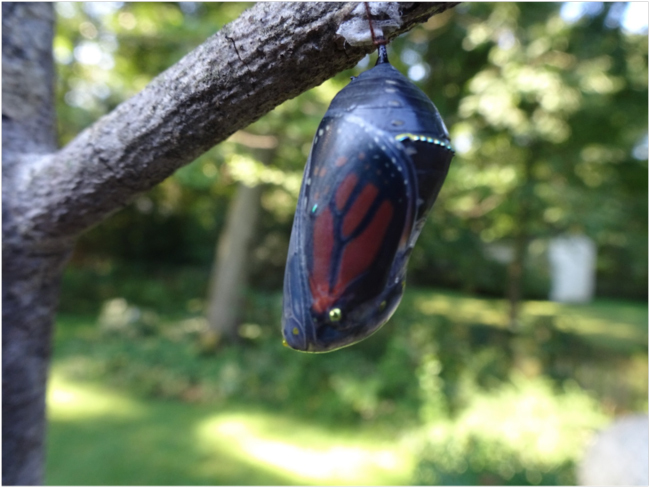 It only took a few minutes for the rippled, rubbery-looking wings to straighten and hang below the new butterfly clinging to the shell of the chrysalis. 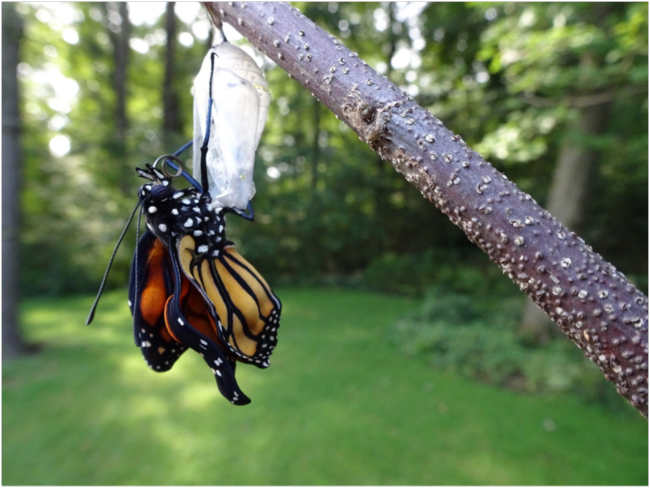 Soon a tiny puddle formed below the hanging monarch as it pumped fluids out of the bulbous abdomen it had emerged with, lightening its body to fly. Most of the eclosing adults hung perfectly still for around three hours. Watching that still hanging, I imagined them in some meditative state known only to monarchs, transforming their brains and bodies for a long journey to a place only known to their great-grandparents. After an hour or two, some would give a few wing flaps, and then hang still again, releasing a few more drops of fluid. Wings gradually darkened, dried, stiffened. But then an internal restlessness set in. Wings were opened and closed repeatedly for a minute, and on the cue of a gust of breeze, the butterfly that had never flown, flew. Compared to the flight of their parents when they laid eggs or scouted my garden, the first seconds of flight for these fledgling monarchs was noticeably erratic and tentative, like drunks wobbling into the streets of the air. Most flapped upward in a few spirals, and headed for a high roost nearby to rest and dry their new wings some more. 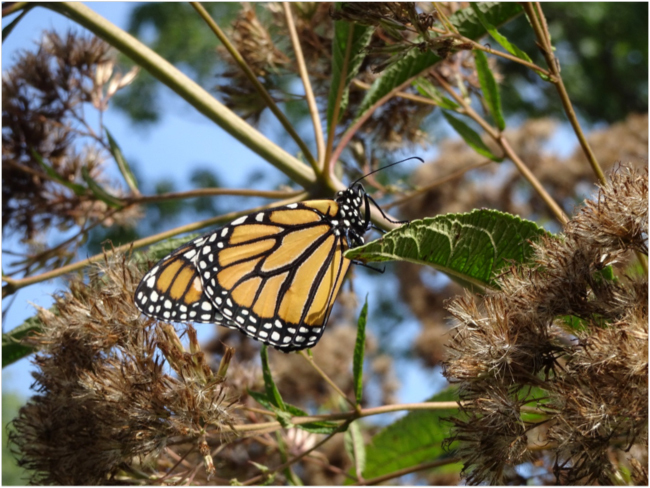 Sometimes the next day I would see a fresh monarch exploring my yard, tasting plants and nectaring from the Joe Pye. 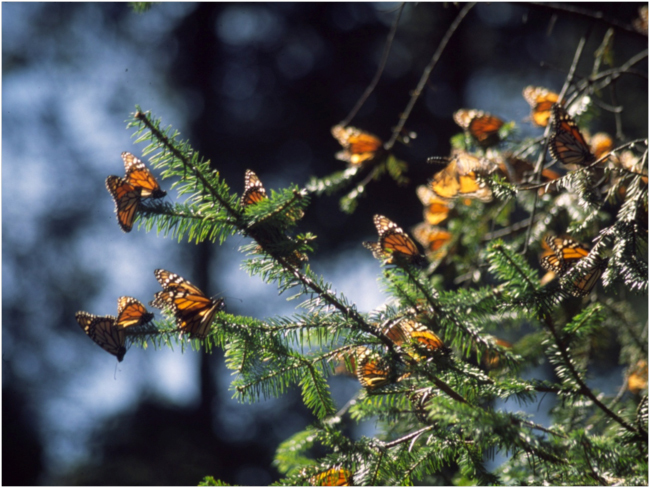 I guessed these were my monarchs, enjoying one more peaceful day and gathering their strength before launching off into the weather of the wide world, on the way to the mountains of Michoacán. I wonder: did they dream of hanging with millions of their kind in the cool forests of oyamel fir? Monarchs at El Rosario Reserve, Michoacán, México. March 2004 photo. This reprise of my monarch field of dreams comes at another cusp in my own peregrination. It’s happening just as I’m getting ready for my own “migration” on a short creative sabbatical of three-and-a-half months from my consulting work. I will be the resident ecologist at the Sitka Center for Art and Ecology, at Cascade Head on the central coast of Oregon, from October to mid-January 2019. Cascade Head is a fascinating place, a UNESCO Biosphere Reserve, administered by the U.S. Forest Service in partnership with a local watershed council and other national and local agencies and organizations. I plan to sink as deeply into the place as I can, learn about its ecology and meet the people who live there and love it, and write about that experience. The word “sabbatical” is usually associated with academic careers, but it of course echoes the seven-day religions, where the seventh-day, the “sabbath,” is a day of rest, of reflection, of looking back on all that was made. But you can also imagine a “sabbatical” more openly, as a reconnection with roots and quests, missions and visions. For me, returning to the Oregon coast will be a reconnection with the roots of my love of nature, seeded in the tidepools at Cannon Beach, Oregon, when I was five years old, and an attempt to pay back a bit of that debt. Of course this would be the fall when monarchs revisit the field of dreams I planted for them in 2010! The everything-is-connected-to-everything-else universe just gets it. Field of Dreams of Monarchs. October 2010. Migrating Hawks and Monarchs, Cape May, New Jersey. October 2011. Pilgrimage to the Monarch Butterfly Overwintering Refuges in Michoacán, México. March 2012. Cape May Hawks and Monarchs. October 2012. Peregrination to Cape May for Hawks and Monarchs. October 2013. Not Man Apart: Genealogy of an Ecological Worldview. August 2014. Monarchs and Hawks at Cape May. October 2017. The Great Tidepool, August 2017. Bruce Byers Bruce Byers Consulting provides technical assistance to government agencies, NGOs, and the private sector in the U.S. and over­seas. We carry out assessments, analyses, and applied research that provide the background information needed to design effective strategies and actions in complex ecological and social contexts. Great photos and narrative. Thanks for posting, Bruce. Very nice as always, Bruce. I had heard you were heading to Cascade Head – I’m looking forward to learning about your experience there! Home | About | Services | Gallery | Blog | Contact • Copyright © 2011 Bruce Byers Consulting. All rights reserved. Website development solutions.